With an epic drama on the power of fate, Verdi's "La Forza del Destino" [The Force of Destiny] paints an immense canvas in one of the Italian composer's most acclaimed masterpieces. The Zurich Opera House and Andreas Homoki have taken on the challenge of producing Verdi's work with Music Director Fabio Luisi leading through the rousing score. "La Forza del Destino" has the reputation for being cursed ever since its première in 1862 which was delayed by nine months due to one of the main singers coming down with a serious illness. From then on it is a story of mysterious mid-opera power outages, unfortunate accidents and even the onstage death of baritone Leonard Warren in New York in 1960. In the Force of Destiny a family conflict arises against a backdrop of war and the inevitability of fate takes its course when Leonora's lover accidentally kills her father paving the way to a fatal ending. The complex storyline presents a unique challenge. "You face this opera with respect because it is a very important, heavy and difficult masterpiece. It has this colour of tragedy but there are also these grotesque parts in it and to bring that in harmony is maybe the greatest challenge," explains conductor Fabio Luisi. 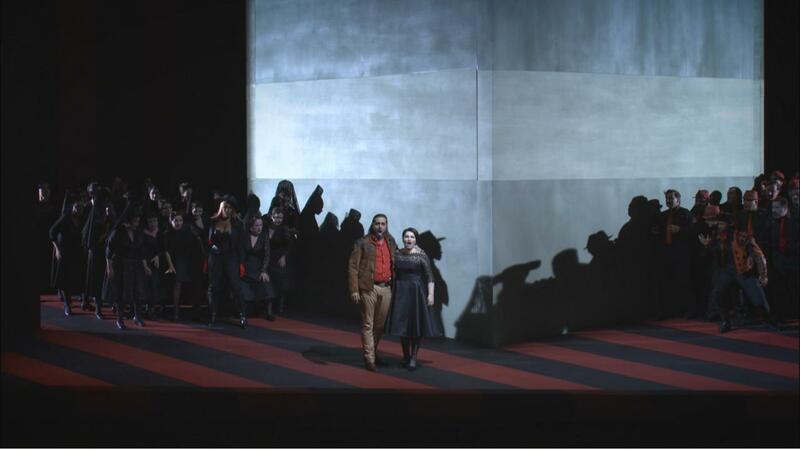 Another challenging aspect of Verdi's opera is the composer's tradition of focusing his pieces on the inner journey of the main characters rather than simply following a storyline. "When you deal with Verdi you realise that he is more interested in the inner conflicts of the characters and not in the surface of the plot and that is also the case in this opera," says stage director Andreas Homoki. To deal with these complexities the team at the Zurich Opera House put in place a sophisticated abstract stage design that allows the audience to take in the characters' struggles. "We created a space that resembles a kind of labyrinth or box, in which we play with the characters," explains Homoki. "There is this cube in the middle, you can go around but you can also leave on each side, but it always brings the characters back together. Actually, it's a kaleidoscope-like stage. There's something magical about it,” expands Luisi. One of the magical moments is Leonora's aria, "Pace, pace mio dio“, a prayer for peace, magnificently interpreted by Russian soprano Hibla Gerzmava. "This is a powerful aria, it is a complete openness of the soul, this is definitely a strong woman who for many years keeps waiting. This is how the force of Leonora is revealed in this aria 'Pace, pace'," says Gerzmava. As most of Verdi's operas, Forza del Destino ends in tragedy with the main character Leonora dying at the hands of her brother. "It is a powerful ending, very intimate. That is why it's so strong. It is a trio of calm and of hope," says Luisi. "This is a complete departure to a world beyond, she is happy. I think that she leaves for paradise because she is really free." The next performances of "La Forza del Destino" are on June 17th, 20th and 28th.